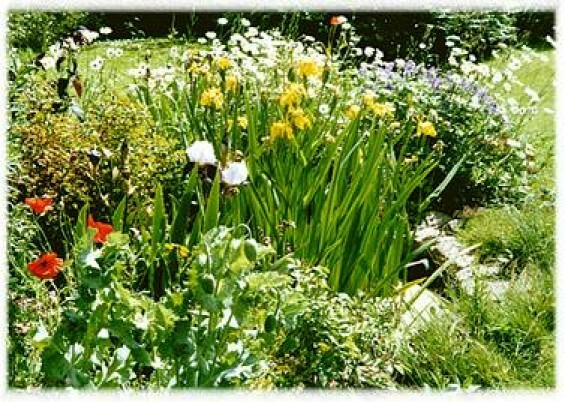 My pond has added greatly to the benefits of being in my garden – it’s a constant source of interest. 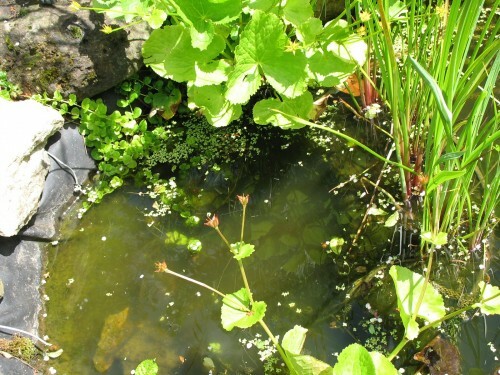 This has, however, come with a few ups and downs, even serious battles, with all aspects of pond creation. Here are a few tales of my pond wars.. The gardener I asked to build the pond was not a professional. The pond turned out to be lop-sided and you could see vast swathes of pond liner; also little creatures could not get out easily, although there was an upper shelf, so maybe I was being too anxious for them. I eventually got the pond redug on one side, with a beach of pebbles put in. This was much better and attracted birds down to bathe and clean their feathers. However the pebbles all fell to the bottom, so we have now replaced most with larger stones, which still let small animals climb out in the cracks. I obeyed the guidance of an organic gardening manual and got some nice hefty tough natives like carex pendula, iris pseudacorus and nymphaea alba. This was a mistake! 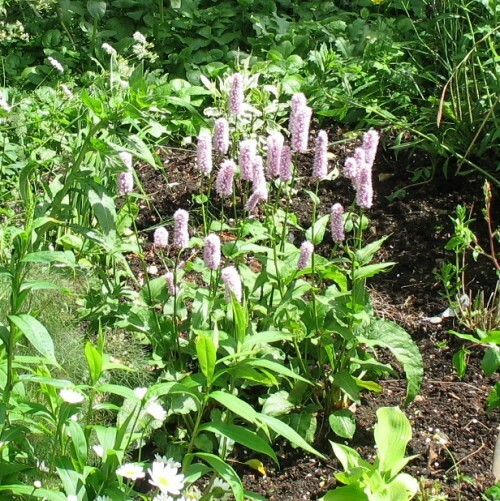 They do well – too well for a small pond and small garden. They looked magnificent (see photo), however the water lily grew all over and up the sides of the pond and the iris grew so big it fell over, frequently and soon after dividing. These were replaced by tamer versions; the carex has stayed. I read somewhere recently that it would take a forklift to dig it out…. 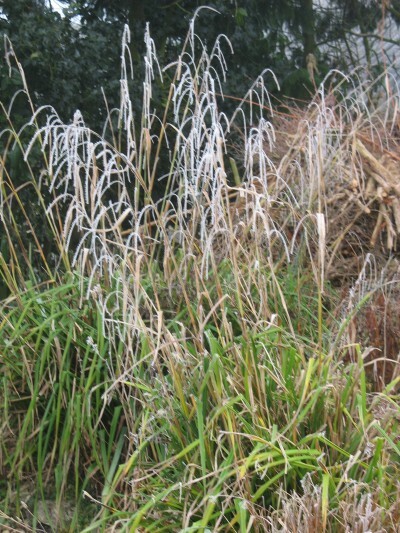 Apparently there was a water plants firm that sold plants like miscanthus and bergenia that are a bit more manageable and cope with clay soil that dries out: an interesting idea. This was Rowden Plants, now closed as a nursery but gardens open by appointment. I am retrying some bog plants like persicaria (red bistort) this year, as it is a shadier spot now, however maybe I should have chosen my year better… If they don’t flourish I shall move them to the shady meadow area. The pond soon got colonised by lots of frogs and toads, as did the rest of the garden – strimming the meadow is dangerous unless you walk through it first to take the toads out! Then, a beautiful grass snake came to the pond and loved coiling itself in and out of the water. The cat and I were fascinated. Frogspawn continued to appear, but not frogs, and I blamed the snake. Sorry no photos – must take some next year! I’d forgotten that we’d found some newts in a bucket awhile before, apparently having fallen off the greenhouse roof. We put them in the pond, not knowing that they eat tadpoles. Now we have many newts – great, though I rarely see them – and I was just about to rig up a frog spawning safety-net, suspended in the pond (idea from a CGS member) when I started seeing little frogs again. Hurray! And big frogs too. 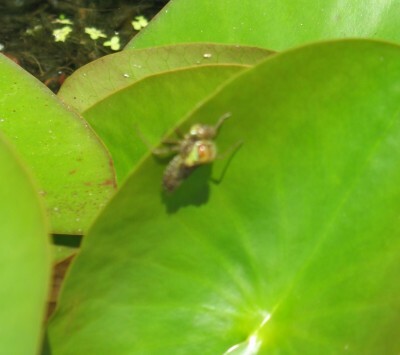 And diving beetles, pond skaters, little shrimp-like things and things that look like tiny underwater flies. So maybe the pond fighters have had a truce. But there’s a new threat. A damselfly larva appeared on a lilypad last week, with big eyes in its back like the Alien. After watching for a few hours I realised this was just the shell the damselfly had left behind in its amazing metamorphosis. Damselfly larva eat everything. Once the damselfly lays its eggs, more larva will soon be lurking.. I am not an expert on ‘dragons’ as the local enthusiast calls them – thanks for the comment. This is the first time I’ve seen one of these cases – and there was another one a couple of weeks later. Looks like planting some straight-up things ie flowering rush and another iris helped them climb out of the pond successfully. Good!